In 2008, Moftasa stumbled upon an old synagogue that was turned into an office for theNational Democratic Party (Egypt's ruling party). It is amazing how the very same Egyptians who were infuriated over Switzerland's decision to ban building minarets are the same people who demolished the Magen Abraham synagogue in Egypt. the wooden floors are in a horrible shape, cables coming and going everywhere, horrible neon lights, overstuffed filing cabinets piled over each other rusting, broken window panes replaced with cardboard and the whole sanctity of the place, that was once there and can be vaguely felt radiating from the large dome and the star of David windows, is replaced with a grim dark grey Mogama3 feel. 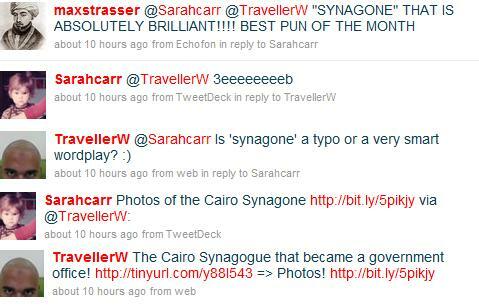 Sarah Carr posted Traveller Within's photos of the synagogue and Max Strasser loved how she played on the gone synagogue and came up with synagone! According to one governorate employee who wanted to remain anonymous, the building is recognized in the district's files, but has no licenses or ownership documents.